DEC Relays Decision to Co-Lead Environmental Review in Pilgrim Pipeline Proposal. The New York State Department of Environmental Conservation’s (DEC) decision to share the environmental review responsibilities with the NYS Thruway Authority for the proposed Pilgrim Pipeline project was a big disappointment to us all at KingstonCitizens.org. Got a Recalled Volkswagen? Donate Your $500 Gift Card to an Environmental Group. When we were looking to purchase a car, it was important to us to find not only one from a company that was environmentally friendly, but also in an age of better technology, to purchase a car that had lower emissions while doing better on gas milage. Of course, an electric car is perhaps the way to go, however the choices currently are limited for what we need, and very costly too. So we opted for a Volkswagen (VW) Diesel which promised as we understood it lower emissions and up to 40 mpg + on the highway. 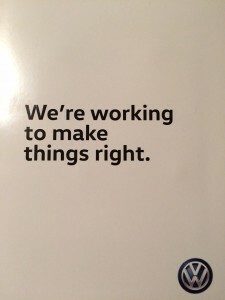 As the world now knows, cars like ours are being recalled. “It’s been dubbed the “diesel dupe”. In September, the Environmental Protection Agency (EPA) found that many VW cars being sold in America had a “defeat device” – or software – in diesel engines that could detect when they were being tested, changing the performance accordingly to improve results. The German car giant has since admitted cheating emissions tests in the US.” according to a report by the BBC. CALL TO ACTION: Citizen Support Needed TONIGHT (12/15) On Critical Resolutions that includes Microbead Ban, Pilgrim Pipeline, Greenline Project in Kingston. 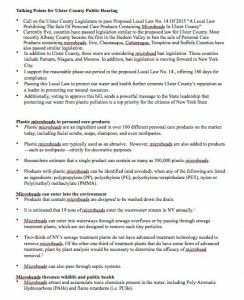 THIS JUST IN: A new public hearing on the Microbead Ban will occur on 1/19/16 and vote by full legislature sometime before the end of January. It has been tabled for tonight. More information coming soon. But please plan to attend to encourage the legislature to pass the remaining three other resolutions. For the past month, KingstonCitizens.org has been following and working towards the public being more aware of the importance to understand the impacts in Kingston of both the Pilgrim Pipeline and proposed Microbead ban proposal – all up for vote tonight at the Ulster County Legislature Meeting located at 244 Fair Street, 6th floor in Kingston. Public comment will begin at 6:30pm. * THIS JUST IN: Plan now is for new public hearing on 1/19/16 and vote by full legislature sometime before the end of January. TONIGHT’S vote will only include the below three resolutions. We have attached information below on each of the resolutions with some key points for you to research before you speak. Please keep your speech to 3 minutes or less. Introduction of Proposed Shooting Range project. New information regarding the application including a membership makes it not possible for the planning board to take an action this month. The planning board will reconvene a public hearing on January 11th, 2016 meeting. On Monday, December 14 at 6:00pm (VIEW KingstonCitizens.org’s Facebook event invitation) , the Kingston Planning Board will host a public hearing on the Proposed Shooting Range project. The sponsor of the project Dr. Adam Soyer, an orthopedic surgeon from Kingston, is looking to build a membership based indoor gun range and gun shop at 90 and 92-94 Prince Street by next fall. The range would be meant for mostly short-range handgun target shooting, with a plan that would host five lanes for shooting as well as a room for education and a gun shop. It has been reported that gun rentals may also be available. 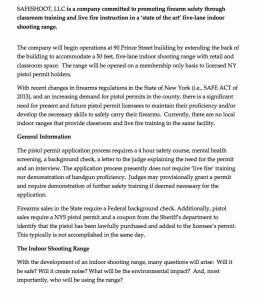 The concerns of citizens who are opposed to the project include not only questioning whether or not the location – in the heart of midtown – is best suited for a shooting range where many renters, businesses and schools are located, but also environmental factors such as proper lead disposal (known as “projectiles” or ammunition), safety/quality of life issues such as potential stray bullets, gun sales and rentals and the upcoming adoption of Kingston’s Comprehensive Plan and an imminent citywide zoning overhaul that will follow to clarify the highest use of property in our Midtown area based on years of public input. 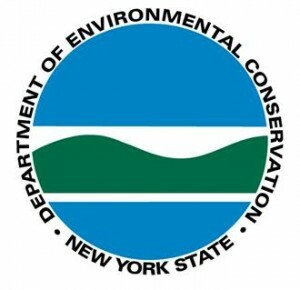 Common Council Unanimously Rejects Thruway Authority’s Lead Agency in SEQR Request. Public Encouraged to Stay Focused on Public Scoping Process Next. After the Lead Agency determination deadline on December 16th, KingstonCitizens.org urges the community to stay informed on the many upcoming phases of the SEQR review for the Pilgrim Pipeline proposal as it pertains to Kingston. We are anticipating a large scoping effort next. Please SUBSCRIBE TO OUR MAILING LIST, and join our growing citizen base to become better informed, educated and effective. Last night, the Kingston Common Council passed a memorializing resolution rejecting the Thruway Authority’s request to be Lead Agency in SEQR for the proposed Pilgrim Pipeline proposal. “I’m thrilled it passed unanimously,” said Julie Noble, Chair of the Kingston, New York Conservation Advisory Council, after the Kingston Common Council’s 9-0 vote last night.